Advocates and policymakers came together to talk about connections between the two crises—and solutions. Patrick Kennedy, founder of The Kennedy Forum, makes a point during EDC’s Pain to Promise event. 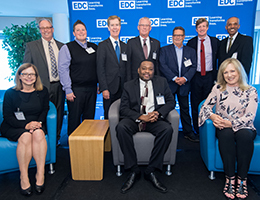 EDC and the National Action Alliance for Suicide Prevention (Action Alliance) recently held “From Pain to Promise: Addressing Opioids and Suicide in Communities Across America,” a town hall event to discuss the connection between opioid misuse and suicide, and potential solutions for restoring hope in communities nationwide. The forum came at a time of increased focus on the connection between opioid misuse and suicide. The nation lost over 44,000 lives to suicide in 2015. The same year, 33,000 people died from opioid overdoses, a tally that includes prescription drugs, heroin, and synthetic fentanyl. In response, the Trump administration has declared the opioid crisis a “national emergency,” and the President’s Commission on Combating Drug Addiction and Opioid Crisis will soon deliver its final recommendations. While several speakers addressed the pain that can lead to substance misuse and suicide, much of the event was focused on ways to restore hope. The forum also included the voices of those with lived experience. Brooke Feldman detailed her own struggles with prescription drugs and depression, which included multiple hospitalizations. Recovery was difficult at first, she said, but she has now been sober for 12 years and is studying to become a social worker. Other speakers for the event represented the fields of addiction recovery, suicide prevention, and mental health. They included Dr. Alex Crosby of the Centers for Disease Control and Prevention; Dr. Arthur Evans, CEO of the American Psychological Association; Gary Langis of EDC; and Kay Warren of Saddleback Church. They discussed solution-oriented ways to improve prevention, treatment, and care for those struggling with substance misuse or suicidal thoughts. Evans discussed the need to build systems of care that are more responsive to communities in need. Feldman talked about the importance of educating, empowering, and informing the general public about things that they can do to support friends and neighbors who may be in crisis. And Langis said that he has changed how he talks about drug use to help reduce the stigma so often associated with addiction. Langis also noted that he drew hope from some current trends, such as law enforcement prioritizing diversion over arrest for drug users. On closing, Reed sounded a similar note of promise. For more about this event, read the event-related tweets on Storify.